When a good cop goes in to battle with Chicago’s ruling mafia, he soon finds out that playing by the books isn’t really an option. By 1930, America had experienced a decade of prohibition. But in Chicago, the booze flowed freely thanks to the notorious gangster Al Capone. With his contacts at City Hall, he virtually ran the city, lording it over a 3 million dollar a year bootleg business. That is, until the Treasury Department sent in a special agent to shut him down for the relatively minor offence of tax evasion. Director Brian De Palma’s big studio film of this historic episode stars Robert De Niro as Capone and Kevin Costner as the initially rather naïve agent Eliot Ness. A newcomer to Chicago, Ness finds himself way out on a limb in the city’s police department where everyone it seems, is on the take. So he forms his own special unit recruiting a bespectacled accountant (Charles Martin-Smith), a crack shot kid from the south side (a terrific Andy Garcia) and an experienced older Irish policeman, played by Sean Connery in his only Oscar winning role. 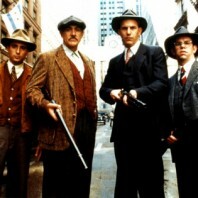 This awesome foursome refuses point blank to be bribed, giving rise to the moniker ‘the untouchables’. And before too long, they’re launching an attack on a huge shipment of grog at the Canadian boarder with the Mounties bringing up the rear. It’s a moment straight out of a western with rousing music by Ennio Morricone, who scored many of the genres’ most famous themes. De Palma also pays homage to the great Russian director Sergei Eisenstein in a climactic shoot out at Union Station where a baby in a pram hurtles down the staircase, echoing that immortal scene in the 1925 silent classic Battleship Potemkin. Never let the facts get in the way of a good story – that was obviously the maxim behind this film because not much of it is historically accurate. Ness didn’t have a wife like he does here, played by a luminous Patricia Clarkeson in her debut screen role, and Capone’s man Frank Nitti didn’t end up quite like Billy Drago’s wonderfully creepy character does. 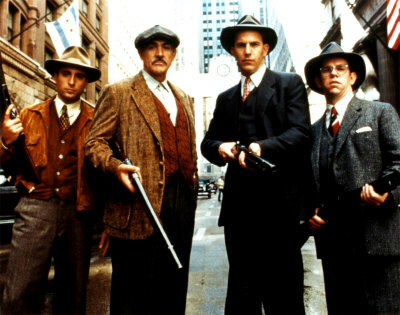 David Mammet wrote the screenplay “suggested” by the television series ‘The Untouchables’ which ran from 1959 to 1963 and Albert Wolff, one of the last surviving members of the 12 real life untouchables was a consultant on the film. But Georgio Armarni, who designed all the costumes, probably had a bigger input in the end. We all know that when governments ban certain substances like alcohol, the trade gets pushed underground where all hell can break loose. The Untouchables is a film about exactly this. After all the violence and mayhem that ran amok in the windy city with rival gangs, corruption and even white slavery, we’re left with the news that prohibition is about to be repealed. It’s an irony that was not lost on Ness. Nor, one imagines, on Capone as he mulled it over for eleven long years behind bars.